Infinit-I Workforce Solutions is the expert in the digital enhancement of employee training & onboarding. A learning management system (LMS) is an employee training software that digitally transforms your company training, onboarding, and documentation. Our customized solution allows you to upload all of your current company content in the system, then be able to train, track, communicate, and report on all aspects of that content. Can you easily generate training reports by individual employee, by groups of employees, by location, or by job function? 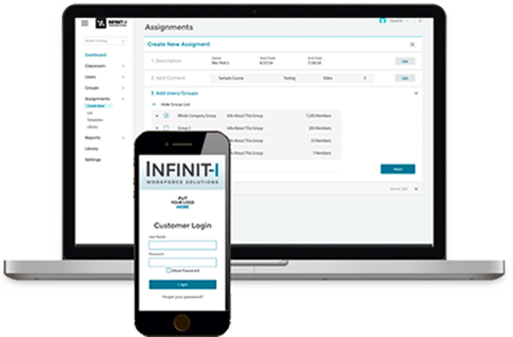 Infinit-I training modules are an average of three to seven minutes long, which improves your employees’ ability to comprehend and remember the material. Our mission is to become a trusted extension of your business that strengthens your company/employee relations, while progressively impacting your bottom line. Each client of Infinit-I is assigned a Dedicated Client Success Representative that trains your staff in how to implement our system and constantly reviews your account for more ways to increase the ROI for your business. Request a personal demo of Infinit-I Workforce Solutions today or experience the power of our system in-person at an upcoming Engage Event seminar. SRT utilized the Infinit-I Workforce Solutions learning management system to deliver customized training about SRT’s billing processes. Their digitally transformed online training reduced billing errors and unbilled charges while increasing the collection of past due receivables.